Today’s building owners are facing increasing pressure to make their facilities operate more efficiently on multiple fronts. Certainly, energy prices remain high in many regions and are a primary driver for businesses seeking to lower their ongoing operating costs. More recently, energy-efficiency regulations also have been pushing owners to understand and begin reducing their energy use. In this post, I’m proposing those owners take a hard look at the value one international standard, ISO 50001, can bring to both efforts – and also help companies gain recognition from the two major environmental certification programs, BREEAM and LEED. In the years leading up to the 2015 United Nations Conference on Climate Change in Paris, nations around the globe became increasingly focused on reducing their fossil fuel-based emissions, and improving the energy efficiency of buildings became a critical component of these plans. To this end, the member states of the European Union (EU) passed two important regulations, the Energy Performance of Buildings Directive (EPBD) and the Energy Efficiency Directive (EED). Energy audits are mandatory first steps to compliance under these directives, and they must be repeated at least every four years to maintain compliance. However, organizations with goals that look beyond one-off compliance with individual regulations can consider an alternative to this audit requirement. The EU recognizes the value both organizations and the environment can gain with more holistic approaches to performance improvement and exempts those organizations that have adopted the International Organization for Standardization (ISO) specification ISO 50001:2011, “Energy management systems – Requirements with guidance for use,” from the otherwise mandatory periodic energy audits. Why would international regulators see such value in a systematic approach to energy management? 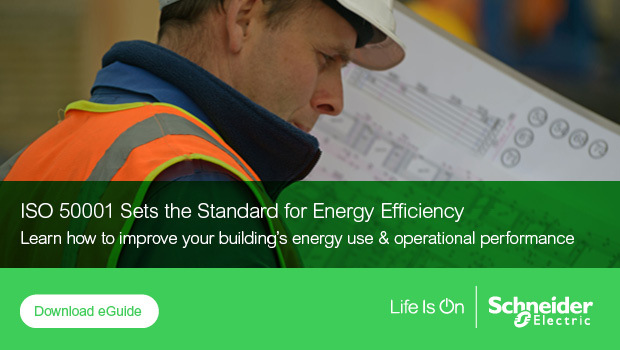 In this case, unlike an audit, ISO 50001 does more than simply take a snapshot of a building’s energy use – it provides a process for using that data to establish new performance goals and set the facility on a path of continuous improvement. 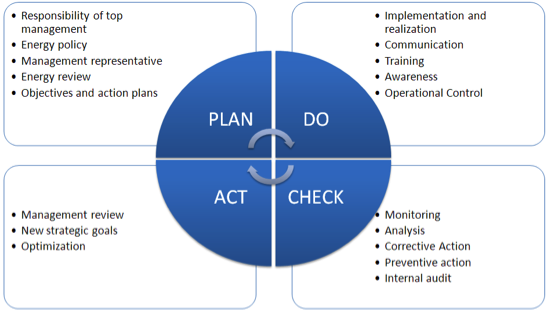 This iterative process takes place in four steps, as shown below in Figure 1. The first step is a corporate-wide assessment to establish a baseline of current use, along with performance indicators to be used to evaluate efficiency improvements. Efficiency targets, along with action plans for reaching those goals, are established. Put the action plans into place. Monitor and measure progress, based against established performance indicators, and report the results. Move to address shortcomings identified in the reported results, and determine new strategic goals for optimizing performance. More than simply eliminating the periodic regulatory audit requirements, adopting ISO 50001 also can be a boon to those organizations seeking certification under the existing-buildings provisions of BREEAM (Building Research Establishment Environmental Assessment Methodology) and LEED (Leadership in Energy and Environmental Development). Recognition by either of these internationally respected programs can add credence to corporate claims of environmental stewardship. LEED has established ISO 50001 as an alternate compliance path for meeting the requirements of its “Existing Buildings: Operations and Maintenance” certification. Similarly, ISO 50001-certified buildings are deemed to also meet energy-improvement requirements of BREEAM’s In-Use certification program. So, not only does implementing an ISO 50001 plan exempt organizations from the expense of regular audits, it also provides easy access to recognition from two of the world’s most influential environmental certification programs – a win/win investment, if ever there was one. You can learn more about incorporating ISO 50001 into your organization in our white paper, “Implementing an Energy Management System: Your Guide to ISO 50001 Compliance .” And to find out how Schneider Electric can help you put a plan into action, check out the Energy Management Services section of our website and register for our dedicated Partner Portal to access additional tools, resources and product information.